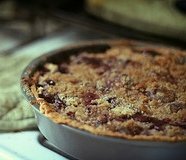 The best fresh cherry recipes must include my homemade cherry pie filling included with cheesecake recipe and homemade cherry pie. Also offering recipes for cherry chutney recipe, cherry cheesecake muffins, cherry cobbler and more below. This fresh cherry recipe is delish. In a large saucepan, combine the sugar, cornstarch and salt. Add the cherries, water and lemon juice. Bring to a boil; cook and stir for 2 minutes or until thickened. Remove from the heat; stir in food coloring if desired. Line a 9-in. pie plate with bottom pastry; add filling. 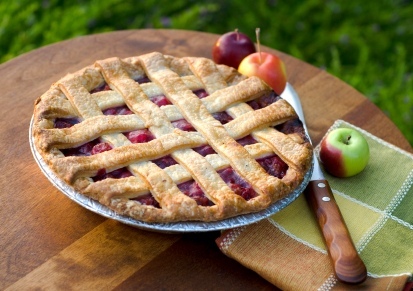 Make a lattice crust; trim, seal and flute edges. Cover edges loosely with foil. Bake for 15 minutes. Remove foil; bake 15-20 minutes longer or until crust is golden and filling is bubbly. Cool on a wire rack. You will be begged to make this fresh cherry recipe. Heat oil and add onion. Sauté until translucent. Add remaining ingredients. Bring to a boil. Cook for 7 to 8 minutes or until mixture is thick enough to coat a spoon. Chill and then serve. This decadent recipe is simply heaven. Cut cherries crosswise into thin slices. Soak gelatin in 2 tablespoons milk. Heat remaining milk in a double boiler. Beat eggs slightly and combine with sugar. Pour hot milk onto the egg and sugar mixture, then return to double boiling and continue to cook, stirring constantly until mixture has thickened enough to coat the back of a spoon. Remove from heat, add soaked gelatin; stir until gelatin has thoroughly dissolved. Refrigerate for 20-30 minutes or until mixture has somewhat gelled. Add vanilla to the whipping or heavy cream, beat in a cold electric mixer bowl until cream is light and fluffy. Fold whipped cream into gelatin, gently, so as not to deflate, but until well mixed. Add cherries and refrigerate overnight. Serve in sherbet glasses and garnish with a dollop of whipped cream and a cherry. Lovely fresh cherry recipe. This fresh cherry recipe is a blue ribbon winner. Beat eggs, cream cheese, vanilla and sugar. Place vanilla wafer in the bottom of the muffin cups. Pour creamed mixture until 1/2 full. Bake for 10-12 minutes and let cool. Top each with cherry pie filling and chill before serving. PREHEAT oven to 350 degrees, and place the oven rack in the lower third of the oven. Grease a 9" springform pan. Combine the graham cracker crumbs with the melted butter and mix well. Press this mixture in the bottom and halfway up the sides of the springform pan. Bake for 8-10 minutes and cool. Beat the cream cheese on medium until smooth and fluffy. Reduce to low and slowly add the sugar. Next add the flour and vanilla; mix well. Add the eggs one at a time, mixing well after each egg and egg yolk. Add the sour cream, and beat mixture on medium for approximately one minute. In a large saucepan, combine the sugar, cornstarch and salt. Add the cherries, water and lemon juice. Bring to a boil; cook and stir for 2 minutes or until thickened. Remove from the heat; stir in food coloring if desired. Divide cherry mixture in half. Pour 1/2 of the cherry filling in the bottom of the springform pan. Pour the cheesecake filling over the cherry filling. Bake for 10-15 minutes. Lower the heat to 200 degrees and bake cake for 1-1/2 hours longer or until cake sets and the center does not jiggle when shaken. If the cake is browning to fast for your liking, cover loosely with aluminum foil. Turn off the oven and leave the cake in for another 20 minutes; DO NOT open the oven door. Take cheesecake out and cool on a rack. After it is cooled, run a knife around the outside edges to loosen from the pan. Refrigerate the cake and the other half of cherry filling overnight. Remove the sides from the pan and place the cake on a platter. Cover with the remaining half of cherry filling. Enjoy this fresh cherry recipe. PREHEAT oven to 350 degrees and grease a 9x13 inch pan. Sift together flour, baking powder and salt; set aside. Beat shortening, 2 cups sugar, eggs and milk until smooth. Blend in flour mixture and well drained cherries; reserve the juice. Pour into prepared baking pan and bake for 25 to 30 minutes. Mix remaining sugar and cornstarch in a saucepan. Add enough water to cherry juice to make 1-1/2 cups. Add the lemon juice and almond extract to cherry juice. Add the remaining sugar and boil for one minute. Serve over pudding squares and top with whipped cream. In a hurry? This fresh cherry recipe is so simple to make (I'm cheating with 1/2 of the cake mix) and something you can make on a moments notice. PREHEAT oven to 350 degrees and grease an 8 inch square baking dish. Spread pie filling into prepared pan and sprinkle with the cake mix. Then top with slivered almonds and butter. Bake for 30 to 35 minutes. Serve hot or cold. PREHEAT oven to 350 degrees and grease a 1 quart baking dish. Place the cherry filling in the prepared baking pan. Top with flour and sprinkle with brown sugar. Dot with butter and bake for 30 minutes. Simple and delicious. Just like the name says, this recipe is truly a delight. PREHEAT oven to 350 degrees and butter a 9x9 inch pan. For crust, mix together 2 tablespoons sugar, 1 cup flour and butter. Press into prepared baking pan. Bake for 20 minutes. Mix together eggs, 1 cup sugar, 1/4 cup flour, baking powder, cherries, coconut and nuts. Pour onto crust and bake for 30 minutes. Mix enough water to cherry juice to equal 1-1/2 cups liquid. Mix in sugar and flour. Cook until thick and add the butter. To serve, place whipped cream on the cake and spread cherry sauce over all. Nothing is as delicious and refreshing as this fresh cherry recipe. PREHEAT oven to 375 degrees and grease a 9 inch square pan. Sift flour with sugar, baking powder, salt and nutmeg. Cut in butter and shortening until mixture resembles fine meal. Combine egg and milk; add to flour mixture. Stir until liquid is absorbed. Press into pan and bake for 20 minutes. Remove from oven and cover with cherry pie filling. Bake 10 minutes longer. Serve warm with whipped cream. "Yum" is what you will hear when you use this fresh cherry recipe. PREHEAT oven to 350 degrees and grease a 9 inch square pan. Mix 2-2/3 tablespoons sugar, flour, cornflake crumbs and butter together and press into prepared baking pan. Bake for 25 minutes and remove from oven. Reduce heat to 325 degrees. Beat eggs well and add remaining sugar and vanilla; beat again. Sift dry ingredients and add to egg mixture. Fold in nuts, coconut and cherries. Spread mixture over baked crust. Bake for 45 minutes. Cut into squares and top with ice cream or whip cream. 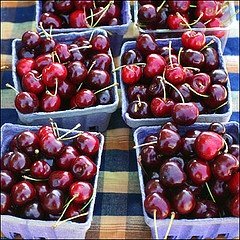 A great fresh cherry recipe. PREHEAT oven to 350 degrees. Grease 9x9 inch baking pan. Mix the brown sugar, 2 tablespoons flour, 2 tablespoons butter and nuts together for the topping and set aside. Beat eggs until fluffy and thick, add white sugar gradually; beating well. Add remaining melted and cooled butter. Add remaining flour with dry ingredients which have been sifted together. Add alternately with milk; mix well. Pour 1/2 of the batter into the prepared baking pan and add the cherry pie filling. Dribble remaining batter over the cherries and sprinkle with the topping. Bake for 45 minutes.